PETALING JAYA: The glass panel at the Sime Darby Medical Centre (SDMC), which has an image said to resemble the Virgin Mary, has been moved to a Catholic church in Klang. 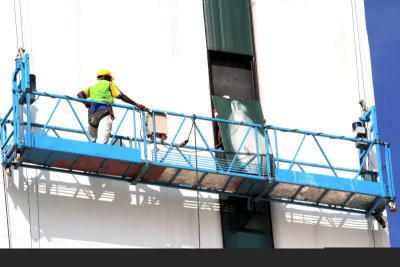 In a statement, Sime Darby Bhd said two panels from the North Tower of the hospital complex had been taken down in a 95-minute operation which began at 10am yesterday. “One of the panels has marks that some claim resemble artistic depictions of Mary, the Mother of Jesus,” the company said. Some eyewitnesses also claimed to have seen another image forming on one of the windows below, which allegedly resembled the face of Jesus. The company stressed that the removal of the glass panels was carried out by professionals and due care was taken. “Church leaders and members of the Subang Jaya parish were present to witness the removal of the window panels,” it said. 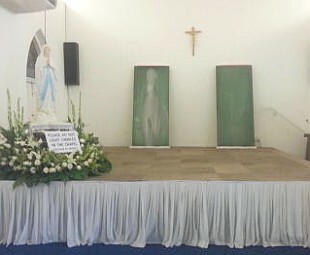 The panels were moved to the Church of Our Lady of Lourdes in Klang. Hundreds of people witnessed the removal process with many whipping out their handphones to record the event. Faith and perception: The window panels at the Our Lady of Lourdes Church in Klang. In KLANG, Catholics turned up in droves at the church as word spread that the glass panels had been brought there. Both panels are being displayed in the chapel, located behind the church. Parish priest Rev Fr Michael Chua said the panels can be viewed by the public from 7am to 10pm daily. Catholics were seen clutching the rosary and silently praying. Many also took photographs of the panels. Retiree Michael Ghana said this was his fifth time viewing the image. He had gone to SDMC four times previously. “Today, the image is clearer than usual. It’s a miracle,” he said. Patimary Anthony Raju, 58, said she was very happy that the panels were moved to her parish church. “I can feel Mother Mary’s presence when praying,” she said.